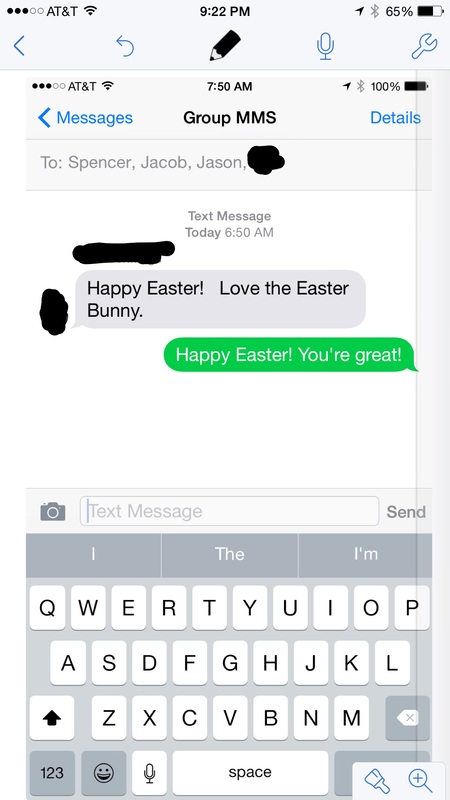 Not just anyone gets a text every year from the Easter Bunny… the real Easter Bunny. At my house, we do. This text is from this past Sunday, but it started years ago when my boys were little and believed in all things make-believe and magical, especially if those things involved candy and/or celebrating. So, they were all in for believing in the Easter Bunny. It almost fell apart way too early though, when they learned his real identity. “[Your dad] is the Easter Bunny?!? When she nodded adamantly, he just looked shocked and sat processing her words. When he confirmed once more, asking if she was sure, I could hear the amazement in his voice. At that point, I understood he hadn’t heard it as a revealing of a parental secret as I might have expected. Rather he believed he had just learned the secret identity of the Easter Bunny. His little mind was whirling with the knowledge that one of his best friends had a parent who was pretty much a super hero. I can’t even imagine how this knowledge changed his perception of our close friend, but I was so glad I hadn’t been quick enough to say anything and ruin the moment. Although my children are teenagers now and have a different understanding of the Easter Bunny, we still refer to him by his real name and always love to get messages from him on Easter. He will always be the Easter Bunny to us. …and I won’t reveal his real identity. Nice to see you back! I have always loved this story. Wonder what the school board would think if they only knew!! His secret is safe with us. « Groceries just show up!!! Really!